Is there a thrill in birdwatching— and for that matter in hiking and mountaineering— half as electrifying as standing atop a rocky summit on a crisp fall day, watching a hawk, falcon, or eagle shoot low over your head? You peer into the raptor’s keen eyes with awe and a touch of fear. Fear—because you sense that the predator is sizing you up. If it were bigger and you smaller, the encounter might end differently, and both you and the bird know it. Autumn hiking and watching hawks go together like clams and chowder. The reason is practical. Raptors traveling toward wintering grounds to the south are as concerned with fuel economy as we are. A meal of mouse, songbird, or something more substantial goes only so far; and so, the birds seek out updrafts. Rising air helps keep them aloft at greatly reduced cost, and they seek it instinctively from two sources: from “thermals,” which are sky-bound air columns that form over agricultural fields, parking lots, sunny meadows, and other warm places; and from what geographers call orographic updrafts. These are created not by heat as thermals are, at least not directly. They arise, literally, when prevailing winds come up against mountains or ridges and find nowhere to go but up. Which is a large part of the reason why, on a sunny, breezy day in autumn, the summit of Marcy, Algonquin, or just about any other bald-topped Adirondack peak might provide numerous dramatic views of raptors. How to tell one from the next? It’s a tricky business. When it comes to migrating hawks, even avid birdwatchers sometimes find themselves in urgent need of help. Identifying accipiters, buteos, falcons, ospreys, harriers, and eagles and their not-so-close relations the New World vultures on the wing has evolved in the space of my working life from an offbeat spinoff of conventional birdwatching into a fine art all its own. 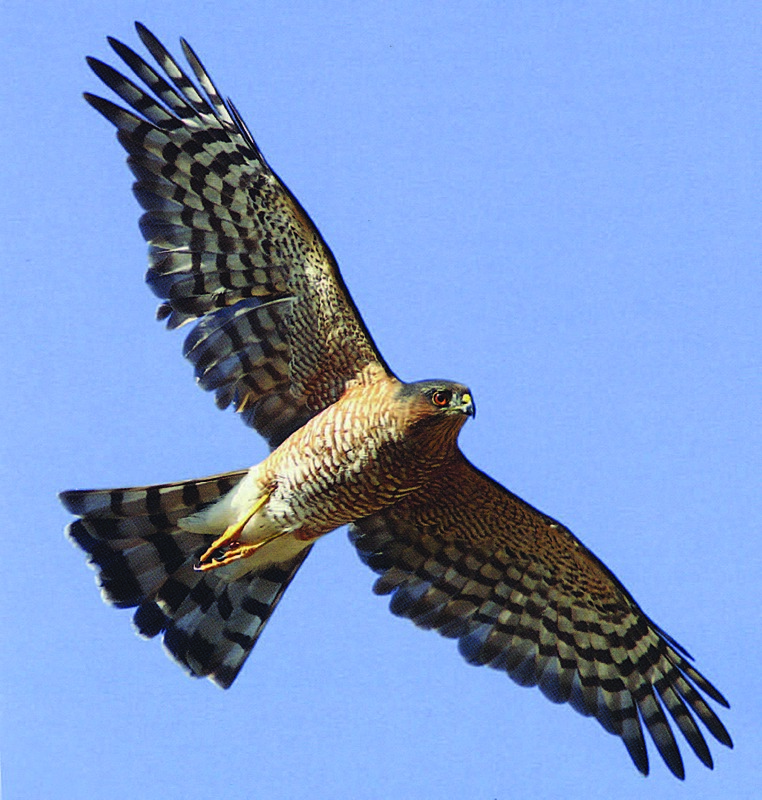 The pursuit took a great leap forward in 1987 with the publication of William Clark and Brian Wheeler’s Field Guide to Hawks of North America in Houghton Mifflin’s highly esteemed Peterson series. Here was a new kind of field guide. Instead of embracing all the birds, it zeroed in on a single group. In so doing it found room to include an astounding volume of useful detail—paintings, photos, maps, all in abundance, plus text that seemed to cover every nuance. Clark and Wheeler’s primacy didn’t last long. The following year, the same publisher released Hawks in Flight: The Flight Identification of North American Migrant Raptors. Full of exquisite line drawings by a then up-and-comer named David Sibley, this book supplemented, and amplified Clark and Wheeler. It paid particular attention to how day-flying predatory birds look as we often see them—blazing fast across autumn skies. While these books remain as useful as when they first appeared, they are now joined by a volume entirely up to date and so richly illustrated with crisp photos that the literature of hawk-watching takes another evolutionary leap forward. 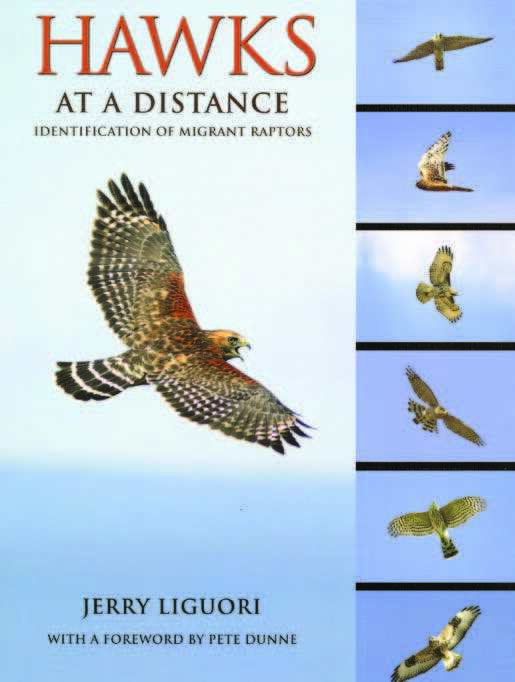 The new book, published this year by Princeton University Press, is Hawks at a Distance: Identification of Migrant Raptors, by Jerry Liguori. Liguori is a veteran hawkwatcher, photographer, and author of the previously published Hawks from Every Angle, also from Princeton. For the present volume, he has done his homework and then some. The result is a book that will help you tell a sharp-shinned hawk from a Cooper’s and an immature bald eagle from a golden, even when the bird is way, way out there. Liguori supplies both text and photos. The whole package is a marvel of concision, marrying just the right images to exactly the right sequences of words. There’s not an ounce of flab on it. Patently practical matters aside, what impresses me most about the book from the start are knock-your-socks-off flight photos, one opening the account for each species. Photos of birds in the air at long distance are this book’s prime selling feature (hence the title), and they make it wonderfully useful. Yet there’s more to a field guide than the accurate and efficient delivery of visual and technical information. The best works of this sort also inspire—fire you up to march outdoors and see and study for yourself. It’s this quality I relish in Roger Tory Peterson’s bird guides, and it also abounds in Hawks at a Distance. These are just some of the book’s images of sharp-shinned hawks in flight. Thirty years ago when I first began paying close attention to airborne raptors near and far, I wish I could have carried Liguori in my daypack. All the detail I needed would have been there, plus those charismatic glamour shots—the red-shouldered hawk soaring on the cover is a case in point—that would have made me grab binoculars and head for the nearest hilltop. Serious quibbles with the book? The only one pertains to a section on ethics. The author rails against nest photography and against the use of live bait in obtaining images. As a photographer myself, I propose that while taking pictures of birds in the vicinity of a nest is not without hazard, it can often be done sensibly. To condemn nest photography out of hand seems no fairer than dismissing nature photography in general. All photographers intrude, but not all intrusions are equal. The best nest photographers have included the likes of Elliot Porter, Hal Harrison, and Lenny Rue. Surely they showed no less concern for their subjects than does Liguori and like him do far more good than harm. As for baiting, while the practice is manipulative without doubt, it is the stock in trade of David Attenborough and the BBC, and there is often more to be said for it than snap judgments allow. Once I witnessed a professional nature photographer bait in a hawk owl. A horde of birdwatchers were seeking the bird that day, and all had come up empty. I’d been the one to spot it. The photographer promptly turned up. Politely, and giving a clear sense he would take “no” for an answer, he asked my permission to bring out mice. I assented, and the bird came closer. In the end, I was pleased. Instead of hounding a rarely seen bird over hill and dale as birdwatchers and photographers sometimes do, this fellow repaid his subject’s energy expenditures with five or six healthy white-footed mice. It was a cold day, and I am certain the owl heartily approved of the practice. Still, without hesitation I doff my hat to Jerry Liguori and Hawks at a Distance. This book will set the standard for books of its kind for the next quarter-century.